Up until 1898 Gràcia was an independent state, which was connected to Barcelona by the Passeig de Gràcia at the limits of today's Old Town. The free space between Gràcia and Barcelona was filled with the Eixample District as part of a major city development program. 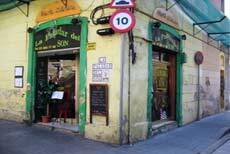 In Gràcia you can find small, narrow streets, alleys and charming squares, which are seemingly chaotically arranged. Everything here is a little more relaxed than in the rest of the city, which is what helps give this artistic hot spot such charm. Several star-rated restaurants and other establishments of high-class gastronomy have settled here. But there are also very many traditional restaurants with reasonable prices here. 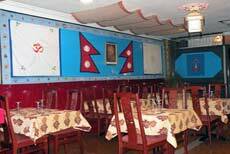 Experience traditional Nepalese cuisine with homemade dishes. All dishes are prepared with natural ingredients and flavours and are incredibly delicious. Discover this soft and delicate cuisine with spices mixed by hand by the experienced Nepalese cook. The menu offers vegetarian and non-vegetarian food. High-quality food in a pleasant and familial setting: Namaskar Nepal. The Llavor dels Orígins (Gràcia) restaurant is located in the Ramón y Cajal, not far from the symbolic Plaza de la Revolución. 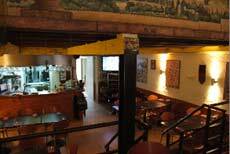 The modern interior of Llavor dels Orígins is a nice contrast to the narrow streets of the district of Gràcia. In the shop you can buy all the ingredients from which the dishes are prepared, and you also have a very diverse selection of wines. The Askadinya is a Palestinian restaurant in the heart of the Gràcia district. It offers typical fare for Arabian and Palestinian recipes with ingredients from around the Mediterranean. Arabian bread is baked here; kneaded using traditional methods. The artistic wall decoration depicts scenes from the historic towns of Palestine, Jerusalem, Nazareth, Acre and Jafa. Nice music, friendly and professional atmosphere. Traditional Spanish restaurant in the Gràcia District. Cuisine with fresh ingredients: paellas, lots of tapas, the finest meat and fish dishes. Spanish wines and sangria. Friendly and quality service. Lounge with air conditioning. In one of the most beautiful streets in Gracia, the Via Verdi. For international guests, some foreign languages are spoken. In addition there are a variety of beers and cocktails. The Bo Verdi specialises in Gin and tonics. The kitchen is always open. 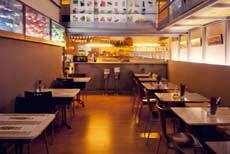 This restaurant in the district of Gràcia is especially popular for groups and families. 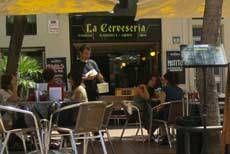 In La Cerveseria you’ll find traditional Spanish cuisine, paella and tapas, hot dogs, hamburgers and salads. The freshly made sangria is very popular. The staff members are fluent in Spanish, English, French and German. You can enjoy lunch and dinner on the beautiful terrace. 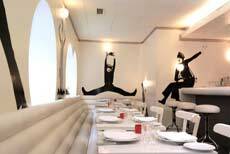 Here you’ll dine at a Barcelona landmark; full of history, design and modernity: Flash Flash. This iconic restaurant opened in 1970. 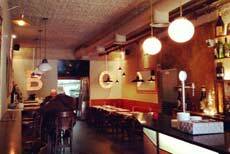 Today you can go to Flash Flash to eat a full meal or just a burger, order a coffee or meet up with friends for a drink. A wide variety of people meet here; entrepreneurs such as writers and journalists, individuals reading newspapers, politicians and other dignitaries, architects or musicians after a show, old and young people. While relaxing in white leather sofas, you can choose from over 50 different tortilla creations. Every day there is a surprise tortilla, and there are seasonal creations by the chef. The burgers are known as Flash Tortillas. The many regular customers are a direct result of the extensive menu, which is adjusted to current trends: but always with the philosophy that only the best, market-fresh ingredients are used for the seasonal dishes. Here you can experience Cuba with all of your senses: Cuban hospitality is celebrated by a Cuban immigrant family; enjoy Cuban cocktails, Cuban beer and Cuban food. Cuba is not particularly famous for its culinary diversity, but free from economic shortages the hosts create magical Caribbean delicacies for their guests. Every Sunday from 18:00 to 20:00 Cuban musicians and singers perform here. Guests are invited to enjoy Cuban rhythms such as Son, Bolero and Guaracha. Guests are also invited to participate.